Sheik Yer Money is a 5x3 reel slot machine with 10 paylines produced by Barcrest. The main theme is based around a rich sheik, who seeks to expand his wealth by harvesting various gems. As such, you will find plenty of rubies, emeralds, diamonds and sapphires on the playing field, alongside the presence of poker card symbols. The main feature of Sheik Yer Money is the Mystic Lamp, which is a mystery symbol that reveals itself at the end of a spin. Alongside it is a Big Bet feature, in which you can choose to bet much larger sums of money than you usually would in favour of earning extra bonuses. These include mystery symbols being locked in place while the Big Bet spins are active, which symbols can appear when the mystery icon is revealed, and if Wilds can be locked in place in the same way as mystery symbols are. Alongside this is a randomly triggered Sheik Shake bonus, which only occurs on a non-winning spin. The sheik will walk from the right side of the reel, and shake it until it changes into a winning combination. Sheik Yer Money is a medium variance title, as the highest reaching single pays only go as far as 250x the wager. It is unlikely gamblers will be reaching any sort of five-of-a-kind wins outside of Big Bet, and the RTP reflects this, being 96.20% for regular spins, while 98.20% for Big Bet spins, a two percent increase. Australian and New Zealanders don’t have to worry, as this pokie will be available at their local casinos. The same applies for the United Kingdom, where this fruit machine has proven a popular release. 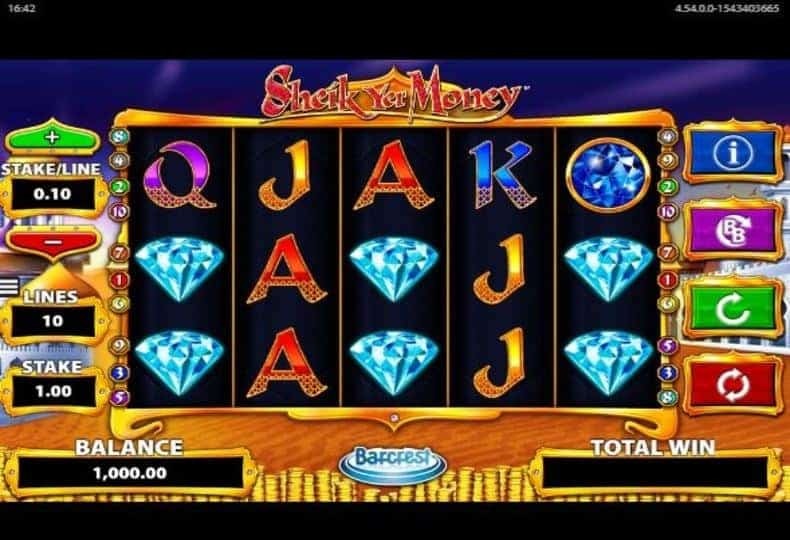 This fascinating slot game, Sheik Yer Money, has a whole bunch of nice options and beautiful little features that keep it fresh and interesting no matter how long you have been playing it for. The main feature, as with so many new games by Barcrest, is the Big Bet. With the Big Bet button, you can automatically go into free spins and get all sorts of features, depending on how much you are prepared to spend. And boy, you really do have to spend - the big bet feature is fun, but it can also break the bank. Do not dispare though, we have a free version, so you can spin away until your heart is content and never lose a penny. Of course, you can never win a penny either (sorry about that), but it's all about entertainment and that's what you get here. As with all our games, we operate a no spam policy - this means that we do not saturate you with pop-up adverts for casinos or ask you for your email address.